IMG_0162, originally uploaded by mrs pag. 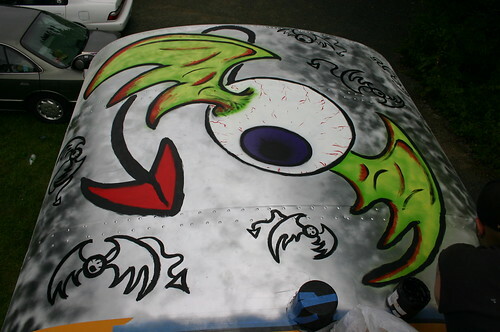 Last week, Christian (a friend of the Tour) went to work painting more of the bus. The result is mind-blowing. In case you’re wondering where it is: it is on the top at the rear of the bus. Anne Marie looks great! Glad to see that the dream is coming together. The best is yet to come guys. Life on the road is awesome. I will keep an eye on your progress. I hope our paths cross sometime. Take care. Thanks for listing us on your site. A couple of 30-somethings take the ultimate road trip.